Fresh herbs add punches of flavor to any savory dish—and some sweet ones*. They also help to cut back on salt, which is a cheaper way to counter blandness in recipes. When you buy fresh herbs, they’ll last longer if you keep them hydrated. You can buy an “herb keeper” like the one in the photo #1, but you don’t need one. 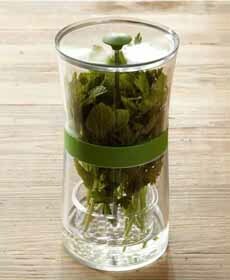 It’s simple to create a makeshift herb hydrator. Most herbs stored this way are good for up to two weeks. 1. PAT the leaves dry. The leaves will last longer if completely dry. 2. DON’T cut the roots: They absorb the water. You can rinse off the dirt if you like. If there are no roots, snip off the ends of the stems so they’ll better absorb water. 3. PLACE the herbs, roots down, in a glass (tumbler) of water (photo #2). The fill should be about one-third up the stems. The roots/ends must be wet at all times, so check every couple of days and add more water as needed. 4. COVER the glass and herbs with a plastic bag before refrigerating. You can affix the bag to the glass with an elastic band if you like. Instead of a glass, you can use a quart-size plastic take-out container with a lid. 5. DRAIN and change the water when it gets murky. If you don’t have room in the fridge for the glass or the quart container, wrap the fresh herbs in damp paper towels and place in the plastic bag. Tuck them your produce drawer. It’s not as effective as Plan A, but it will help extend the life of the herbs. Most importantly: USE those herbs! Parsley, for example, can be mixed into scrambled eggs, garnish soup at lunch, snipped onto potatoes or into salads, mixed into vegetables and grains at dinner. This Cuisipro Herb Keeper is available at Williams-Sonoma (online only). 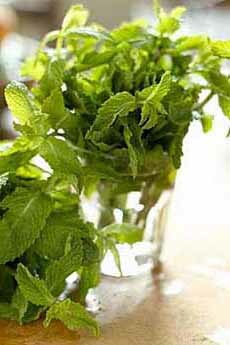 Fresh mint in a glass of water (photo courtesy Suvir Saran | Indian Home Cooking). You can use it to make parsley butter for fish, meat and veggies (and butter your bread, of course). You can mix it into plain yogurt as a savory topping or dip. Check out this article on using herbs, including herb-and-food pairings and the difference between herbs and spices. Big, leafy basil prefers to be kept at room temperature. Follow the drill above; just keep the basil on the counter. *Think of basil with peaches and other stone fruits; rosemary with apples, chocolate and strawberries; tarragon and mint ice cream or sorbet. Check out these desserts with herbs.